Might just be me and my secret wish for nicer photography, but it seems that there is an increase in imagery in the Danish press featuring bicycles. Or rather, an increase in the quality of the imagery. I've noticed one national daily, Berlingske Tidende (founded 1749) upping their artistic sensibilities of late. Like the photo, above, taken in Aalborg yesterday morning. 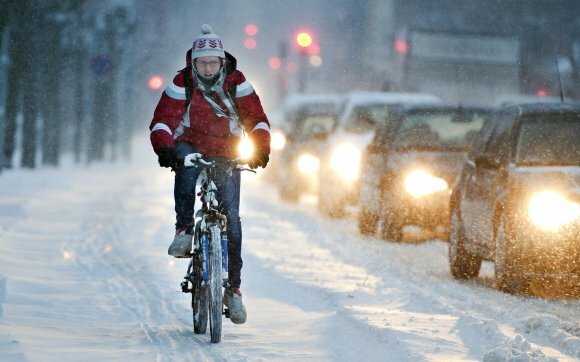 It's a simple article about the weather but it features a cyclist rolling on the bike lane in the snow (past all the cars on the road, of course). The temperature was about -10 C, with a wicked windchill. Then there was this weather article from late last year about rain and wind. Beautiful shot. Like all of these photos, showing cyclists adds a human element to the story. 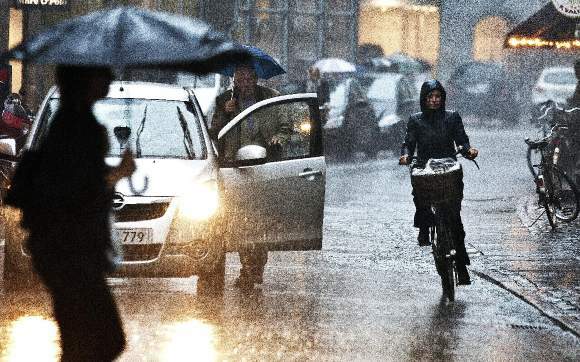 In a country like Denmark we can relate to the weather when we see a fellow citizen struggling through the elements on a bicycle. 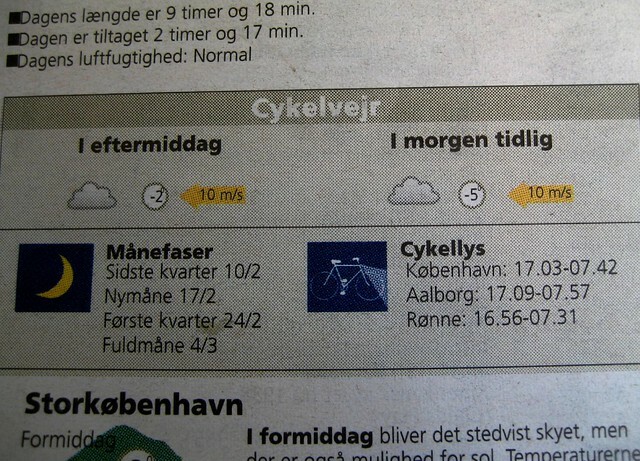 The same newspaper used to have Bicycle Weather included on their weather page in their print version. Showing the temperature and wind direction as well as the times for turning on your bicycle lights. I don't know if they still feature it. Technology has dictated that most papers get fed weather data from one or two sources and the weather reports in the newspapers are more homogenous (read: dull) now. 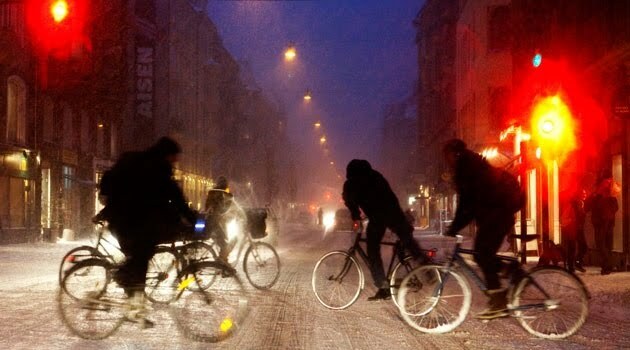 Even Visit Copenhagen - the city's tourist bureau is gradually waking up and smelling the bicycles. About time, too. The above photo features in an article about a new winter festival called WonderCool. This is a photo on a brochure for Adult Education courses [Italian for Beginners, Learn to Knit, etc] from 2006. There are few countries where a photo of a female cyclist struggling through a snowstorm would be used to sell a product. A product that involves getting out on cold, dark winter evenings to learn how to make pottery. But hey, this is the normalcy of cycling here and such images are understood by the population.